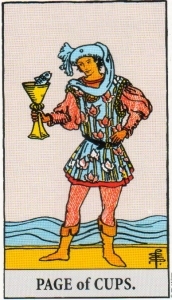 Learning how to use Tarot Cards, we begin with the Suit of Cups. This is the suite of emotions. The cup is a symbol of pleasure and fulfilment, happiness and joy. This suit represents the humane person in each of us.  These interpretations are based on the Rider Waite Tarot but also include relevant comments from other packs and commentators. The italicized comments are mine and from time to time I will expand on them. You will note that I almost always work on the positive of the card. 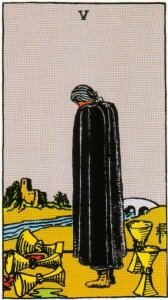 The subject for whom the reading is being made will benefit more from being given positives tempered with warnings, than being given a serve of doom and gloom.  Each card tells a story and it is important for you to build your own story lines using these explanations as a guide. After all it should be your own story line that matters. Symbols - Five streams of water spring from a cup and pour into a pool with waterlilies. The cup is supported by a hand emerging from a cloud and a white dove is placing a wafer in the cup. Meaning - Great abundance. Fulfilment, happiness, perfection, joy. Favourable outlook. Reverse - Change, alteration, instability, unrequited love, greed. Raise your cup and drink to your success. This card is one of the better omens for success in the pack. One is well on their way. The reverse warning is to not to become carried away by the trappings of success, to keep ones eye on the desired outcome. 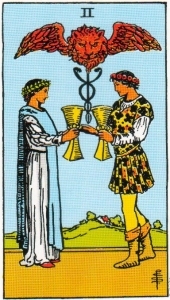 Symbols - A young man and young woman each hold a cup as they look into each other’s eyes. Above them there is a Caduceus (two serpents entwining a rod), and a lion’s head with spiritual wings. Meaning – Love, friendship, beginning of renewed passion, union, partnership, marriage. Reverse - unsatisfactory love, troubled relationship. Separation, divorce. 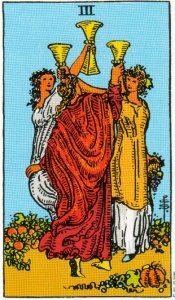 Symbols - Three maidens in a garden each hold their cup aloft is if in salute or celebration. Meaning - Resolution of a problem. Conclusion, satisfactory result. This is a card of mastery of situations. Reverse - Excess, overabundance, pettiness, lack of appreciation. 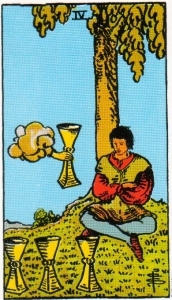 Symbols - A young man seated under a tree contemplates three cups in front of him, whilst a fourth cup held by a hand emerges from a cloud. Meaning - Weariness, stagnation. Not moving forward. Reverse - New possibilities. New relationship. New approaches to old problems. I often 'see' a combination of both meanings in this card. 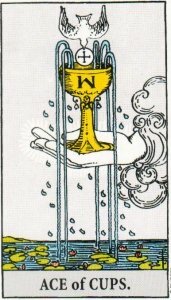 A new approach is called for with the fourth cup providing new answers or opportunities. 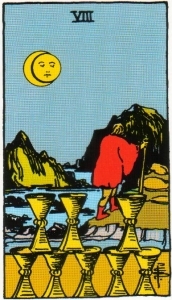 Symbols - A figure with head bowed stands by three spilled cups . Behind him are two full cups and in the distance is a castle across a stream. Meaning - Partial loss. Regret. Incomplete union or partnership. Reverse - Hopeful outlook. Favourable expectations. New alliances. 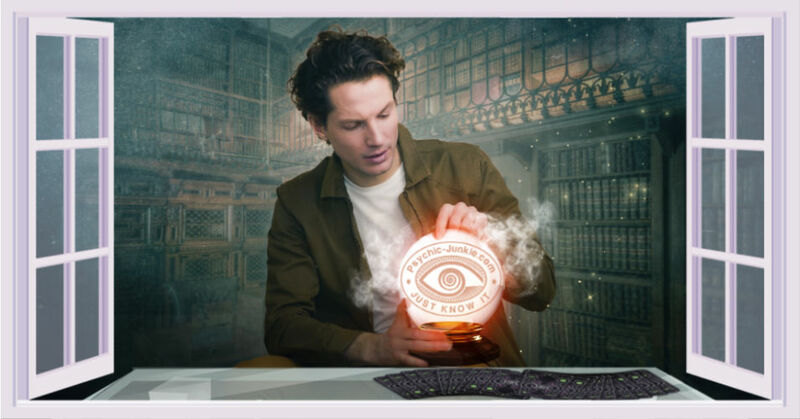 A stroke of bad luck which is tempered by a stroke of good luck. This is a reminder to keep the larger picture in mind. Lose some, win some. Don't become fixated on the negatives. Good things are happening too. Things are never as bad as they first appear. Get over it! 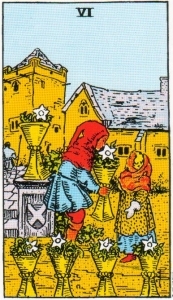 Symbols - Two children play with cups filled with flowers. Meaning - Memories, Past influences, nostalgia. Things that have vanished. Longing. Reverse - The future. Opportunity ahead. Coming events. You may encounter someone from your past. Indicates nostalgia. Let this be a sign of how far you have come. Don't let your future be a reflection of your past. 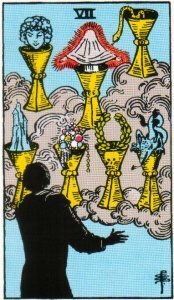 Symbols - strange visions arise from seven cups in the clouds before a figure. Meaning - Fantasy, unrealistic attitudes. Imagination, daydreams, wishful thinking. Reverse - Desire, determination. Strong willpower. A goal nearly attained. The subject can't make up their mind. Too many possibilities. Don't be pressured. After all, choosing not to decide is still a decision. Symbols - Eight neatly stacked cups are in the foreground. A figure is observed fleeing from the scene. A lake or stream is in the background and the crescent moon is above. Meaning - Abandonment of previous plans. Disappointment, shyness. Reverse - Happiness. Effort maintained until success is attained. Festivity. Symbols - A robust man sits before nine cups on a shelf behind him. Meaning - Success. material attainment. Abundance, good health, happiness. Reverse - Mistakes, material loss. Misplaced truth. Opposition, dispute. Symbols - A young couple embrace while two children frolic nearby. 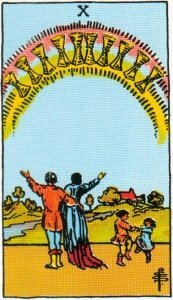 The mas arm is raised towards a rainbow containing ten cups. Meaning - Home. happiness. Joy. Family life. Contentment. Attainment of hearts desires. Reverse - Loss of friendship. Family quarrel. Opposition. Difference of opinion. 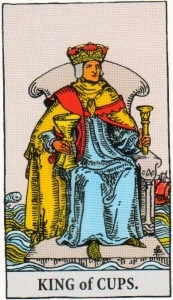 Symbols - The page holds in his right hand a large cup from which appears a fish. Meaning - A studious and intent person will appear. He is loyal and willing to help. A trustworthy worker. Reverse - Temporary distraction. Obstacles. 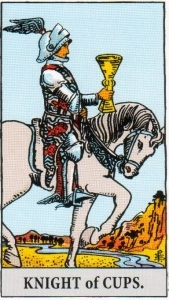 Symbols - A knight rides across the card holding a large cup in his right hand. Meaning - An invitation or opportunity shall soon arise. Reverse - A person capable of swindling. Deception, fraud. This the classical knight in shining armour. He is the bearer of important messages. 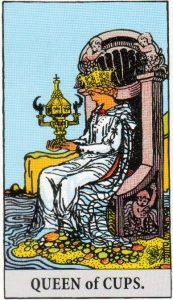 Symbols - The crowned Queen of cups holds a great cup in her two hands as she sits on her throne at the water’s edge. Meaning - This is a warm hearted and fair person. A good friend and mother. The gift of vision. Reverse - Dishonour. Possible immorality. Unreliability. 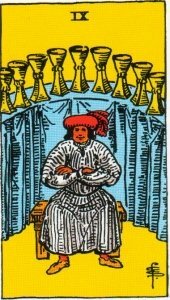 Symbols - The crowned King of cups holds a great cup in his right hand and a sceptre of authority and knowledge in his left hand. His throne is set upon the sea and in the background are a ship and a dolphin. Meaning - A fair man of business, law or divinity. A learned person, considerate, kind, reliable and generous. Reverse - A selfish deceitful person. Can indicate considerable loss.